[Ottawa – January 16, 2015] The political landscape appears as frozen as Canada is. The Liberals hold a slight but statistically significant lead, while the Conservatives appear to have stabilized at 31 points, which is good news for a party that hadn’t broken 30 points in two years. So all in all, there isn’t much going on as we enter a new election year. Nevertheless, there are some interesting signals and harbingers worth watching. And sometimes, the absence of movement is notable in itself. Final Update 2014: Harper’s late year bubble may have burst? [Ottawa – December 15, 2014] Yet another new normal has set into the Canadian political landscape as we head into an election year. Some unexpected events have altered the last normal which saw the rejuvenated Liberal Party – led by Justin Trudeau – clearly in the driver’s seat and on the cusp of what would likely have been a majority government (had those numbers persisted to Election Day). A renewed security focus and other events following the shootings in Ottawa have produced a virtual deadlock between the Liberals and the Conservatives. Race Tightens as We See Security Shifts in a More Anxious Public? [Ottawa – October 31, 2014] The impacts of the tragic deaths of two Canadian soldiers appear to be affecting the political landscape in a highly significant fashion. While not entirely unexpected, the clarity and significance of the effects may be altering the political calculus around an early election. The race has tightened significantly with the Liberal lead now cut in half and the Conservative Party now clearly ahead of the NDP. 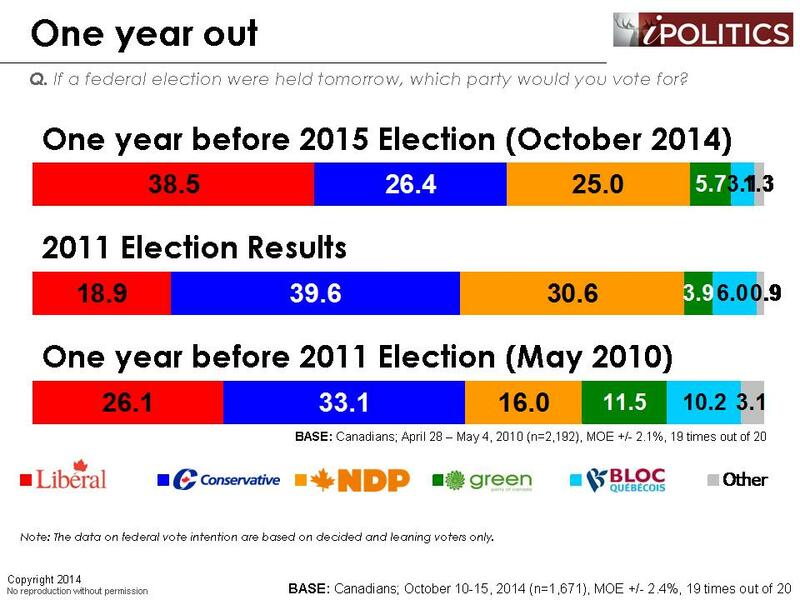 [Ottawa – October 19, 2014] It is exactly one year to the day until the 2015 election and the country remains in a funk, with unusually poor ratings of both national and federal government direction. Outside of the diminished Conservative base, the vast majority think both the country and the federal government are moving in the wrong direction. While our most recent poll has shown a slight uptick in federal direction, is not meaningful and the Conservative Party remains mired at 26 points in vote intention. [Ottawa – August 10, 2014] As part of a pretty comprehensive diagnostic poll on a range of current issues, we have conducted an update of the political landscape in Canada. There is nothing particularly remarkable about these results, but put in context with the overall time series which precedes it, and some of the other more probing questions we will be releasing later, this poll really does not augur well for the Stephen Harper and the Conservative Party. [Ottawa – May 2, 2014] The period of the past few weeks has been an unusually auspicious one for Stephen Harper and his government. The more or less regular cacophony of critical commentary which has characterised the past year of his regime’s dealings with media, opposition, and critics was temporary displaced by a series of surprising events. What is Really Going on with the Federal Political Landscape? [Ottawa – October 29, 2013] The recent Senate spending scandal is registering strongly with voters and shaping up to be a truly frightening shock to this government’s prospects as they try to hit the reset button in lead up to their Halloween Eve convention. It comes on the heels of a series of setbacks which finds the government in its most precarious position since it assumed office some seven plus years ago. [Ottawa – July 23, 2013] If there has been one issue plaguing Thomas Mulcair since he was elected Leader of the NDP more than a year ago, it is not the “Angry Tom” label used by his political opponents, nor it is his questionable driving tactics. Rather, it is simply that Canadians are not familiar with him. For months, when asked whether they approve or disapprove of his performance, nearly half of Canadians have not felt confident enough to express an opinion. This poll was conducted using Interactive Voice Response (IVR) technology, which allows respondents to enter their preferences by punching the keypad on their phone, rather than telling them to an operator. We used a dual landline/cell phone RDD sampling frame for this research. [Ottawa – April 16, 2013] Fidelity isn’t one of the strong points of Canadian voters but Thomas Mulcair seems to be suffering a bit of a loyalty problem with his new party. A year after assuming the leadership of the NDP and the office of the leader of opposition, he is experiencing significant difficulties. He hasn’t seen anything in the polls which could be termed a disastrous or precipitous fall — but he has seen a slow slide which will become a disaster if it isn’t corrected. WHAT DOES THE EVIDENCE SAY SO FAR? [Ottawa – April 12, 2013] Despite the fact that there is no imminent election, speculation about the viability of Stephen Harper’s leadership of the Conservative Party is rising. As we near the midterm we will consider what light the trends in public opinion might shine on this question. So in the absence of anyone having asked us the question, and undoubtedly studied indifference to our conclusions on the part the subject of this analysis, we will proceed.